Umbrellas have always been simple in the fashion industry. However, as we continue to experience significant innovations in the fashion industry, same has been witnessed with umbrellas. This fantastic umbrella is a living tale of what modern creativity can produce when applied to manufacturing an umbrella. There are many types of conventional umbrellas, however; by getting this umbrella to present it as a gift to your targeted market, will lift your company status. This promotional umbrella comes with an automated close and open feature. It has a canopy that is manufactured from a high-quality polyester. It folds to 16” long and has got a two-section folding metal shaft. It also features an ergonomic black rubber coated handle that comes attached to a wrist strap. 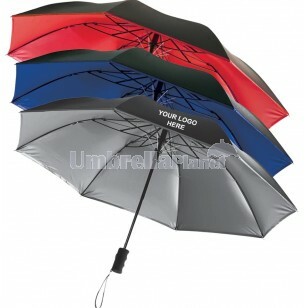 This umbrella is suitable for use during rainy and sunny days. The shape of the canopy ensures that almost the top half of the body is covered from the sun or rain. With an option to print the umbrella with your preferred company logo, it is ideal to use for brand promotional purposes. Delivery time within Australia for umbrellas orders takes up to 2 weeks. However, fast delivery can be arranged at an extra cost upon your request. There is a $60 setup fee charged. Note that all prices exclude GST. Pricing includes one colour, one position printing. Umbrella Planet is dedicated to giving you fast and secure delivery within Australia. We service all states and territories including; VIC, NSW, ACT, QLD, SA, TAS, NT, and WA. Contact our sales team for exact delivery costs and times to your location.